Royal Enfield is the sixth highest selling brand in India, competing against brands with an average product value of almost 50% than the most affordable RE model. The range starts from Bullet 350 at INR 1,34,699 and goes up to INR 2,38,109 for Classic 500 Stealth Black ABS. The values mentioned here are on-road Delhi. Royal Enfield currently retails 18 different models that are primarily based on three different engines and two frames. The most selling product, Classic 350, now comes with the rear disc as standard. It can also be bought in Redditch Edition and Gunmetal Grey option, both available without ABS in the country. 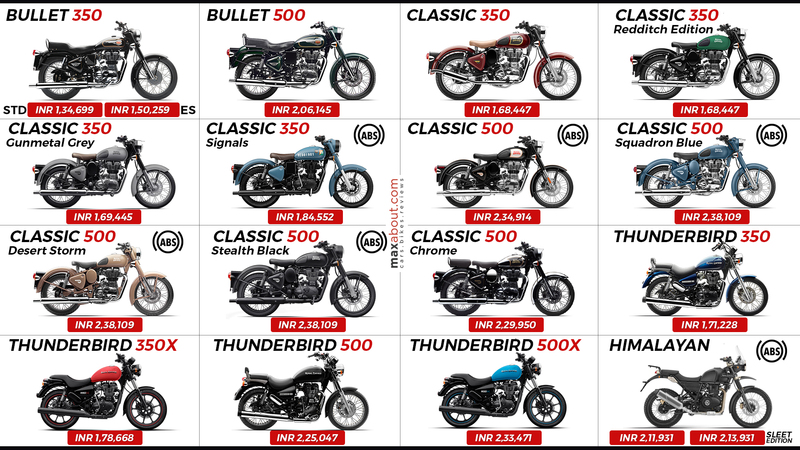 350 Signals is the flagship Classic variant with an on-road price tag of INR 1,84,552 and two exclusive shade options. The rear disc is now standard across entire lineup except for the Bullet 350 and ES variant. The former from both of these come without a front disc. Downloaded 95 times this week.